I picked up the CX-1 at a yard sale for $1. It needed new batteries, thankfully the battery compartment was still good. Replacing the batteries on the CX-1 required me to remove two plates on the back. Thank goodness for the small screwdriver sets. 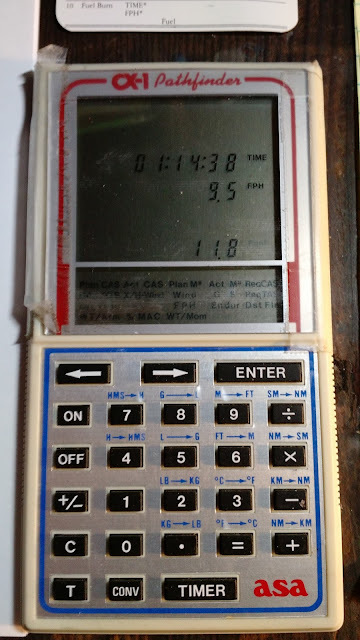 The CX-1 (and subsequently the CX-2 and CX-3) is a unique type of calculator, which focuses on solving problems in aviation, as well as a timer, stopwatch, work with time (hours-minutes-seconds), and conversions. The keys are soft, so presses have to be deliberate. 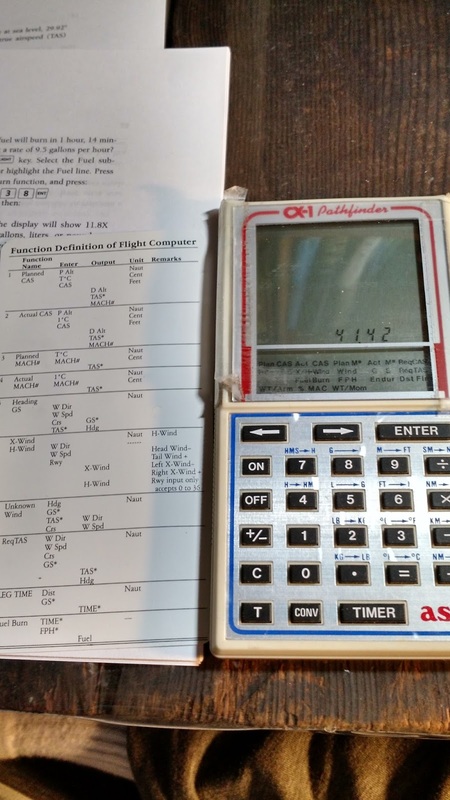 The CX-1 had a vertical screen separated into two parts: the above portion has the calculator and the solver and its prompts. The CX-1 is an LCD calculator, hence the prompts for the solver were locked in place. When using one of the flight applications, whatever prompt you are working with flashes. The bottom part of the screen contained all the solvers available. I wasn’t able to find a manual for the CX-1 online but was able to find one for the CX-2 and together with the help card that came with the calculator to determine which solvers were included. Note CAS does not mean computer algebra system for the CX series. In regards to direction, direction is measured in degree angles 0° to 360°, with respect to due north (I think), meaning at 90° wind goes west, 180° wind goes south, and 270° goes east. Navigating the solvers takes a little bit getting used to, which is controlled by the arrow keys ( [ ← ], [ → ]). The left key also acts as down when you are at the first item in a row, while the right key also acts as up when you at the last time in a row. The solver that is being selected will have its prompt flashing. Use the [ T ] key after each component. For example to enter 23 minutes 28 seconds, press 0 [ T ], 23 [ T ], 28 [ T ]. To activate the stopwatch, press the [TIMER] key. To stop the stop, press the [TIMER] again. Clear the stopwatch by pressing the [ C ] key. For the timer, enter a time and press [CONV] [TIMER]. The CX-1 does not have a beep. The CX-1 features a handful of conversions, all accessed by pressing the [CONV] key first. The current version, the CX-3 has a backlit, color screen, and can be flash updated. Added in the second version are density altitude and rhumb-line navigation calculations. Also the weight calculations have been streamlined. I think the square root function is also added. For a specialized calculator in aviation, the CX calculators (seemingly) fits the bill. The keys on the CX-1 are soft, but are easy to use. To the key is to pay attention to the prompts. The CX series either enhances or replace the flight computer slide rules. If you are into aviation or a profession, the CX is worth checking out.